When I was growing up, I had natural hair. Thick, full, coiled-so-tight-it-could-be-cotton hair. 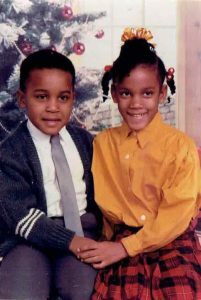 And my mother, for all her patience and creativity, would style my hair in cute twists and pigtails with those precious bubble hair ties when I was a few years old until middle school rendered that too kiddie, and therefore too embarrassing, a style to pull off in front of my classmates. So I started wearing box braids–thin, individual braids done with synthetic hair for length and longevity–for years. I’d put them in and wear them for the usual lifespan of four to six weeks, remove, wash, rise, and repeat. I probably wore this hairstyle for years before high school was upon me and I needed a more “grown up” style. But having a more age-appropriate hairstyle wasn’t the real issue. It was really about the agony that came with dealing with my natural hair: the missing comb teeth from detangling a demon knot, the inevitable shrinkage that came with wetting my hair, the six to eight hours it took to redo the box braids month after month. It was all tiring and honestly, a bit played out. I wanted something new. Enter the relaxer. 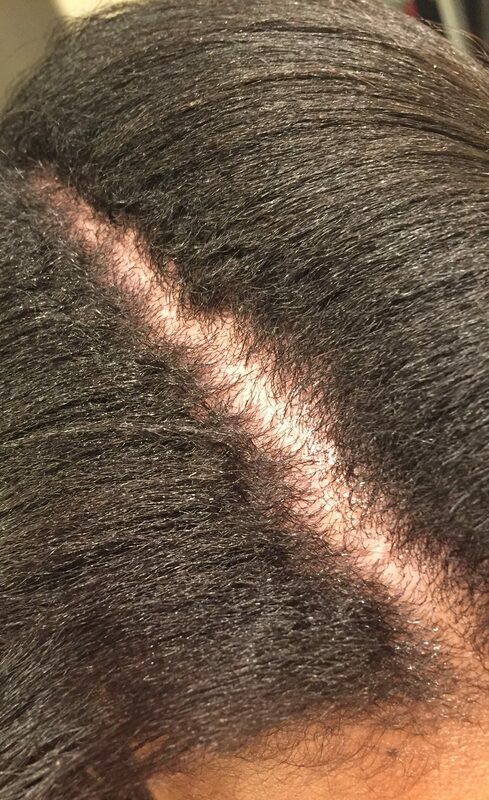 Yes, that nap-straightening, scalp-burning “creamy crack” that so many of us African American women apply to their roots every six weeks to keep our hair straight. I relaxed my hair for the first time around the age of 15 one night after preparing to get my hair braided for the umpteenth time. I remember looking at my mom and asking her if I could pleeeeease get a relaxer so I didn’t have to suffer through another long night of hair braiding. Surprisingly, she said yes. And an hour later, my several inches of natural curls transformed into straight, smooth, shoulder-length hair. Wait…I don’t need to hold back tears anymore when I brush my hair? I can actually run a comb through it without breaking anything? I can actually pull it back in a ponytail? Whaaaat?! I was hooked. I remember sitting in a mirror on days when I was freshly relaxed and flat-ironed, swaying my hair from side to side and falling in love with the movement. Don’t get it confused; my happiness wasn’t from a desire to have European-looking hair. It was a desire to have manageable hair that just happened to look “good”. Fast-forward 15 years later to this year on the warm spring day that I woke up to relax my hair and decided it was for the last time. The thing about those relaxers is that they are extremely damaging to your hair. The amount of chemicals used in a relaxer literally destroys the natural curl pattern in your hair until it penetrates deep enough to permanently straighten it. 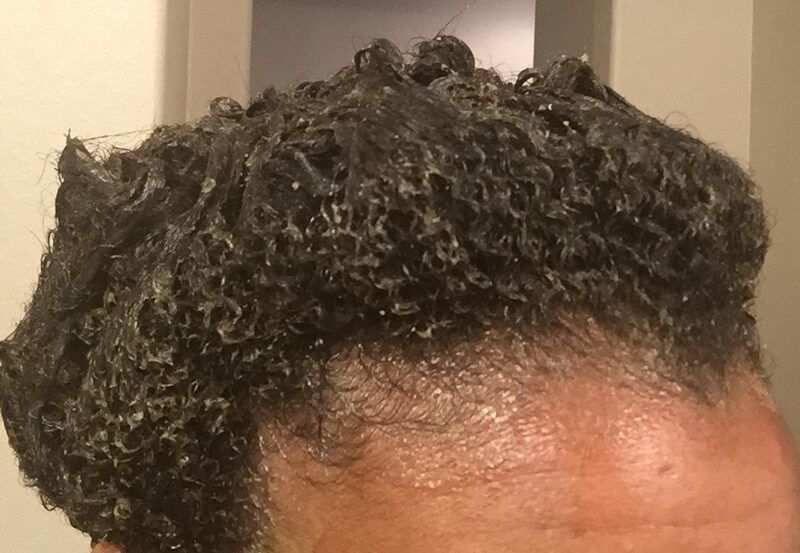 But worse, the relaxer needs to be applied every six weeks or so to make sure any new growth is straightened too. This causes most of us to over-process previously relaxed hair because it is hard to apply the relaxer only to the new growth without getting it on the straightened hair, no matter how much hair oil you use to protect it. 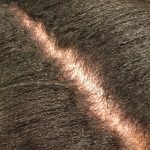 Plus, with my already prone-to-dryness scalp, the relaxer would literally burn my scalp after only a few minutes and I often woke up the next day with scabs from the damage. Add, on top of that, the fact that I was flat-ironing and blow-drying my hair at least once a week. After years of relaxing my hair, I realized I could never grow my hair beyond shoulder-length because it was breaking off from all the chemical and heat damage. At some point, we ignore the warning signs of damage: thinning edges, hair breakage, and a scabbing scalp. We sacrifice our hair and scalp health for the preservation of easier-to-maintain hair. And after 15 years, I decided enough was enough. I decided to go natural. And let me be the first to tell you that it is not an easy process. In April, after my last relaxer, I knew I had about a month left of straight, manageable hair that I could easily manipulate into styles. But once mid-May rolled around, the new growth was real. I noticed that it was harder and harder to run a comb through my hair, and memories of lost comb teeth started drifting into my thoughts as I tried to maneuver my way around a head full of two hair textures. 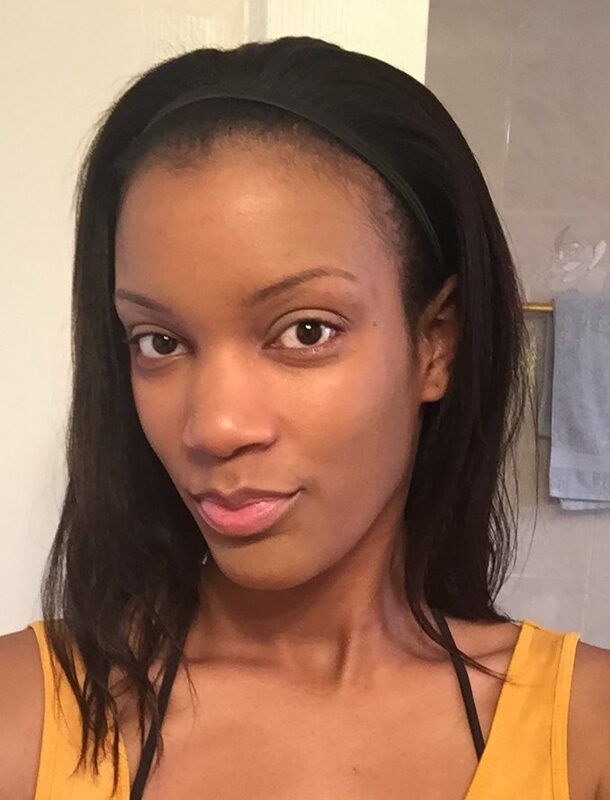 My natural hair was hard to comb through, and my straight ends were breaking off. It was scary. And as many times as I thought about reaching for my last-resort emergency relaxer, I decided to stick with it and at least give it a chance. I mean, there must be SOMETHING good and worthy about going natural with such a large natural hair community nowadays. Maybe I just needed to hold on a little longer to wait for the obsession to kick in. I remember washing my hair one morning and getting out the shower and seeing these beautiful, adorable curls spring to life in the mirror. I had about an inch of new growth, which I was constantly hiding with bantu knots and twist-outs to blend my two hair textures, and I didn’t realize just how “long” my natural hair had gotten. I remember that moment. I was absolutely in LOVE with my curls. I ran my fingers through the roots of my hair and was reinvigorated by the thickness, the softness of the hair I was blessed with. It was strong, silky, rebelliously beautiful, and best of all, healthy! It was that moment when I realized how excited I was to fully grow out my natural hair–and how tempted I was (and still am) to cut off the stringy, weak, damaged relaxed ends, ends that look like they are hanging on for dear life when my freshly washed curls shrink up in protest against their chemically straightened nonsense. Thus began my natural hair journey. And if any of you know me well, you know that I’m the queen of new projects. I love doing things that make me feel like I’m either expressing myself creatively or making myself a better person. And with this new journey, I’m able to do both. Growing out my hair allows me to wear protective styles like box-twists (similar to the ones I used to dread getting as a child), as well as weaves that I never would’ve attempted to try on my relaxed hair. It allows me to be courageous enough to try new styles and products. I learned that a lot of the shampoos and conditioners I was using were the root cause of why my scalp was so dry. I now completely avoid shampoos with harmful chemicals like sulfates and parabens that are irritating to my scalp. Even better, I started making my own haircare products after researching and experimenting with what works on my hair. The results are amazing. I have a healthy scalp and my relaxed ends aren’t breaking off anywhere near as much as before. And I’m actually excited about washing my hair now. I can try variations of my product recipes and save money in the process, since I was previously collecting a shameful amount of new hair products, most of which were satisfactory at best. I only have a few store-bought products that I use in my hair that I absolutely love, and they are all from Black-owned businesses. I’m only 6 months into my journey, and I decided that I would cut off my relaxed hair on my two year relaxer-free anniversary. It will be a scary step since I’ve never had short hair before, but I’m excited to see how liberating it feels. In the meantime, I’ll continue spending hours watching youTube videos of other “naturalistas” who started their natural hair journey. I’m learning SO much (from haircare regimens to popular naturalista acronyms like TWA, teenie weenie afro), and I can’t wait to see what my hair texture will look like when the relaxed ends are cut off! 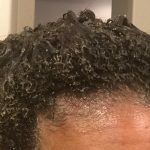 This entry was posted in Journal, Natural Hair Journey and tagged hair.